The Stellas from Rock Hill SC, I mean Charlotte NC, are having their CD release party this Saturday at The Evening Muse. They will follow that up with a show at The Money on the 25th with This Machine Is Me. 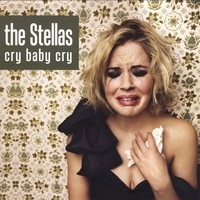 This is The Stellas Debut album entitled “Cry Baby Cry” which was produced by Joe Kuhlmann, who has produced albums for a group of good artist in the Charlotte area including The Transmission Fields, The Houston Brothers and The Near Misses. The title of the album is funny to be because this is what my brother used to yell at me when he would beat me up and tickle me to death as a child. I was no match for my brother who is 7 years older than me until I was 8, when I learned that biting or a shot to the balls would always ward him off. The Stellas have a wide array of influences ranging from The Beatles and The Kinks to modern rock giants The All American Rejects and Weezer. The Stella’s have the same affinity for strong melodies and catchy hooks. Go Check them out and order their CD!